Starting a relationship with a new vendor sometimes feels akin to old-fashioned courting. The process is deliberate, but slow, due to all the steps that need to be taken to ensure a fruitful marriage. You are introduced to all the right people, learn about each person’s history through formal presentations, visit the headquarters (which, in Portwell’s case is decked out in regal purple from wall to wall), and take the hardware out for a test drive. It seems like a lengthy process for being a cutting-edge technology company; however when we introduce a new mainboard line to our selection, we want to be sure it’s going to work. The majority of our customer base requires that we keep products around long enough to support their projects. We’re not talking months; we’re talking years. How do we feel about Portwell? We’re extremely happy to introduce Portwell premium mainboards and systems to our selection, starting with the industrial WADE-8020 QM57 and the WADE-8075 D525. These are two options that we think nicely complement our product line and provide reliable, feature-rich, long-life platforms. The WADE-8020 features diverse video and networking I/O, making it ideal for industrial control, digital signage, kiosks, or the medical field. High-performance Intel Core i5/i7 processing power with a total TDP of less than 60 watts. HDMI, VGA, and DVI-D, dual Intel Gb LAN, 2 RS-232 COM, 6 SATA 3 Gb/sec., 4 USB 2.0 ports. Multiple expansion options: PCI, PCIe x1, PCI Express Mini Card slot (on bottom of board). Intel Active Management Technology for remote service and support. The WADE-8075 is designed for more industrial applications, offering 3 RS-232 COM ports off the back panel along with a built-in watchdog timer. Intel 1.8 GHz D525 processor and ICH8M chipset (pair is on Intel’s embedded roadmap). 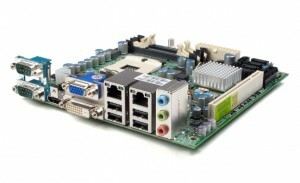 Multiple expansion options: PCI and PCI Express x1 as well as PCIe Mini Card slot and CF slot on the bottom of the board. Onboard DC power; great for custom enclosures or cases without power supplies. Expect to see other options available soon. We think this is the start of a wonderful relationship!